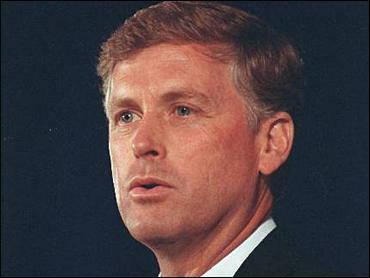 Dan Quayle Urges Tea Party Not to "Go Perot"
Former Vice President Dan Quayle is urging the Tea Party movement not to "go Perot" in a column that will appear in this Sunday's Washington Post. Responding to speculation that the right-leaning but non-partisan movement will form a splinter party that runs its own candidates in the upcoming elections, Quayle calls on Tea Partiers to avoid such a strategy ahead of the midterms in November. "There's a well-worn path of third-party movements in American history, and it leads straight to a dead end. A cause gathers strength, and its message speaks to millions; then, amid the excitement, a new political party is born, only to perform poorly on Election Day and disappear a cycle or two later," writes Quayle. Quayle knows from personal experience that the result of such movements can be a fragmenting of the vote that ends up benefiting political foes. "Many remember the Reform Party of the 1990s, which formed around the candidacy of Ross Perot," the former Vice President notes. "I sure do, because it eliminated any chance that President George H.W. Bush and I would prevail over Bill Clinton and Al Gore in 1992." "Speaking on behalf of the Bush-Quayle campaign, to this day we firmly believe that Perot cost the Republican Party the White House," he adds. Recent polls indicate that the Tea Party could lead to a similar situation if members run their own candidates. In a potential three-party race, 15 percent of respondents would vote for a Tea Party candidate, a recent Quinnipiac University poll finds. Thirty-six percent would vote for a Democrat, while only 25 percent would opt for a Republican. According to Quayle, voting for a Tea Partier would actually benefit the "big-government agenda" that the movement actively opposes. Because 74 percent of self-identified Tea Partiers classify themselves as Republicans or independents-leaning-Republican, their votes would largely be siphoned from the GOP column. For Quayle, the movement's positions on fiscal matters and national security align well with GOP values. He thus calls on Republican leaders to reach out "to an independent grass-roots movements whose energy and conviction the party badly needs." Given the "growing discontent with the administration" and its "unjustifiable expansion of federal power," the emergence of the Tea Party has the ability to resurrect a Republican party that looked all but defeated in 2008 -- if the movement is harnessed correctly. "If the tea party remains an independent political force in 2012, with no partisan ties, so much the better. All that Republicans need to do is speak to its issues, compete for its votes and heed its example of a confident and unapologetic challenge to a liberal president and Congress," writes Quayle. Brewing Tension Between "Patriot Groups"
Tea Party vs. Coffee Party: Are Angry Protest OK?